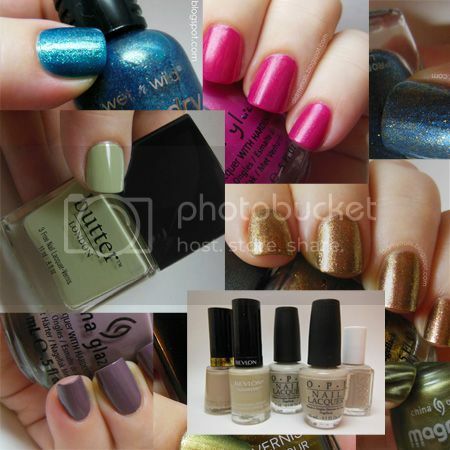 With summer drawing to a close, some of my fellow Tuesday Twinsies and I were talking about polish picks for the changing season and decided to put together some posts about it. With Ash in charge, we set the limit at 15 polishes to represent not only specifically autumn colours but also some of our transitional picks from summer to fall. Neons were especially huge this summer, but the arrival of autumn doesn't have to mean putting away everything pink. China Glaze Ahoy!, from the Spring 2011 Anchors Away collection, keeps that cheerful brightness of the summer neons going while still giving a nod to the changing season. 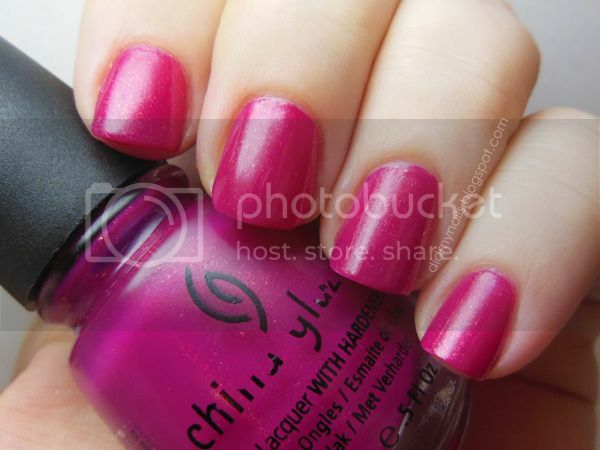 This fuschia pink jelly has some strong blue undertones, but there's a gorgeous golden shimmer to it that gives it an appealing warmth. 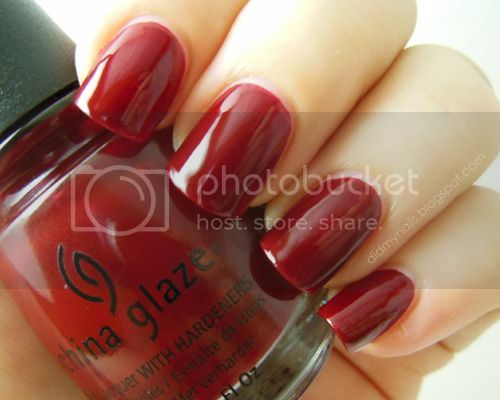 China Glaze Drastic is a fantastic red that I originally swatched back in May. Loved it, looked forward to wearing it a ton, and then all the awesomely bright summer colours started rolling in. But now I think it's time to bring out this luscious jelly again. It actually makes me think of Snow White, from her crimson lips to that irresistible candy apple, but despite being a deep, blood red it stops just shy of full-on vamp, making it a great shade to carry through from summer to fall. These 5 polishes are all one big pick for fall. A couple lean slightly pink, one is more grey than beige, but overall they represent a putty/beige range of neutral polishes that are great for this time of year, whether worn alone (classy and subdued) or as a base for layering (yay, glitter sandwiches!). Left to right, these are Revlon Elegant, Revlon Colorstay Bare Bones, OPI Skull & Glossbones, OPI Did You Ear About Van Gogh?, and Essie Jazz. 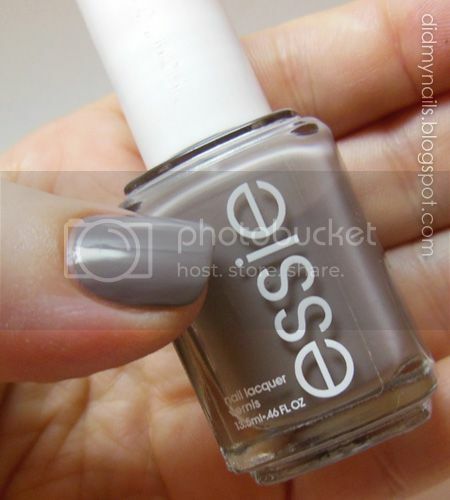 Essie Chinchilly is a classic "greige." The little hint of taupe in this soft grey shade gives it a touch of warmth. It's neutral without being boring, interesting without being overt, another great colour to carry through from summer to fall. 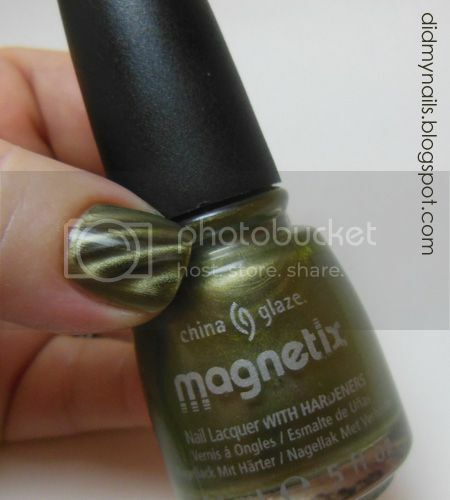 Cling On is one of 4 polishes from the first China Glaze Magnetix collection that I bought months ago, tossed in with my untrieds, and then totally ignored. I loved the magnetic patterns, but the colours just didn't grab me once I brought them home...possibly because, like, several of the other polishes on this list, they came out just as I was getting excited about all the bright, beautiful colours of summer, making these darker shades seem a little blah by comparison. But after several months of neon brights I'm ready to start wearing some of my darker colours, and the mossy green of Cling On (the Trekkie in me loves that name way too much) went and caught my attention all over again. Wanting to incorporate some darker colours doesn't mean I'm ready to go all dark all the time, and Zoya Bevin is another of my untrieds that may have finally found its season. I love bright, pretty aquas like China Glaze For Audrey and Aquadelic, and Zoya Wednesday, but Bevin has an awesome hint of grunge-y grey to it that makes it just that little bit more reserved and complex. It's still light and pretty, but it's a little more muted than the shades I kept reaching for all spring and summer. Pretty much my perfect personal pick for a transitional polish. The first few times I picked up OPI Warm & Fozzie, from last year's Muppets collection, I didn't think it was that interesting a polish, probably because I was so caught up in all the sparkly glitters it was released alongside. Well I'm more than willing--happy, even--to say I was completely wrong. Warm & Fozzie is a beautiful blend of gold, brown, and bronze foil that's part-shimmer, part duochrome, and all kinds of awesome. It's a perfect polish for fall. I. Love. This. Colour. I'm not even particularly partial to purples myself, but I completely love this colour. China Glaze Below Deck (like Ahoy! above, part of last spring's Anchors Away collection) is a gorgeous shade of lavender-grey that's muted enough to flirt with neutral greiges but still bright enough to be a colourful compliment to anything from white to purple to beige to black. 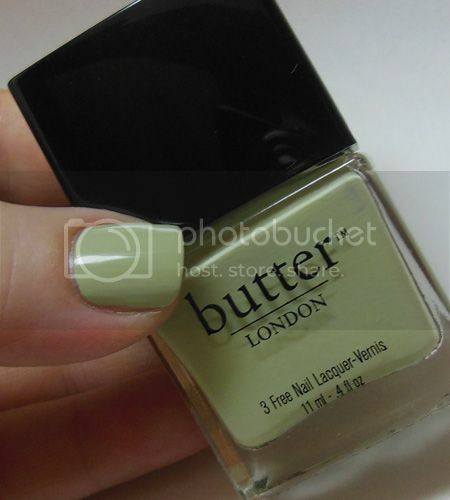 Another choice that's not specifically "autumn" in colour but a great transitional polish from warm to cooler months. Wow, I didn't realize just how many China Glaze polishes I was picking for this list...but this one is actually from their fall collection! Kalahari Kiss, which I used just recently as a base for these zebra stripe nails, is one of several gorgeous colours in the China Glaze On Safari collection (which, by itself, could easily have filled half this post or more). Of all of them, I chose Kalahari Kiss because I think it's the most unique of the bunch. I'm definitely going to need a backup bottle of this warm, banana beige because I don't ever want to run out of it. Another pick that says I'm not going to go gently into those dark colours of winter, Wet n Wild Teal of Fortune was an impulse buy from my last trip to the States, and I love, love, love it. It's some kind of awesome love child of a jelly and a foil and just completely packed with sparkly blue and gold shimmer. This is as colour-accurate as I could get it, but it's just a little bit greener than this. Somewhat darker than this summer's flashy, neon hues, it's autumn-appropriate (for me, anyway) while still residing firmly within my favourite range of aquas and teals. Between that and being glittery as all get-out, I plan to wear this one a lot. Like its partner in the Muppets collection, Warm & Fozzie, OPI Designer... De Better! is another fabulous colour for fall. This champagne-silver is sprinkled with...I'm not even sure what to call them...bronze? cinnamon orange? flecks that give a warm, inviting glow to this highly metallic foil. 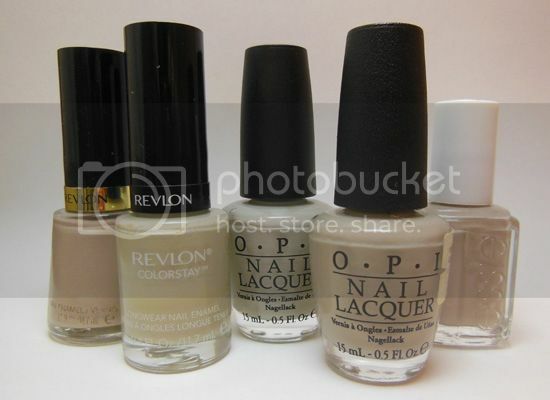 My final pick on this list isn't a polish; it's an entire collection. When the China Glaze Hunger Games Collection came out, some said it was a little dark, a little murky for a spring collection, and as much as I love quite a few of the polishes in it, I can see their point. But now that summer is giving way to fall, I think it's the perfect time to give this collection another look. Honestly, these are some spot-on, perfect colours for fall! The golden, mossy green of Agro; the fiery orange shimmer of Riveting; the beautiful bronze of Harvest Moon...this collection has autumn written all over it. So those are my fifteen picks for fall. Phew! There were so many more polishes I wanted to include, but I think this was a pretty good representative sample of the colours I'm looking forward to wearing over the next few months...at least until the next, new collections come out! And also there's glitter. Lots and lots of glitter. I had to draw the line somewhere, though. Now I'm really looking forward to seeing what the other ladies chose for their lists! I really like all of your choices! I was surprised and happy to see Teal of Fortune on your list. All great colors!!! I love them! I totally want Warm and Fozzie...it's so pretty, and something different than the pinks and blues I normally gravitate toward! Great fall picks (and pics)! What a great 15 fall colors collection - they look great on you! Great picks!! I love that you included the Hunger Games collection, to me there were so many awesome fall colors in that lineup so I'm excited to start wearing more of them this fall! Such great picks! Loved it! Awesome post!!! I have got to pick up Bevin! ChG Drastic, WOW I did not know that exsisted. Thanks! Great collection of shades. I never thought of doing a skittle with some of the shades from Hunger Games (ChG) collection. This is an unusual fall season in that we are seeing a ton more color this yr and many of those shades are much lighter than what we have seen used for fall in the past. Not sure I can pull off Bevin - it's that chalky white that looks so bad on me and on top of that, it's in the green/turq color hue that I just don't look good in for some reason - ditto with things in power blue too. I have not see this shade of red from ChG - Drastic before - it's a good one - I am doing a lot of reds right now for my transition time. It's hot, hot still were I live and am in shorts and sandals still and will be for another 3+ weeks - so done with neons but not able to pull off deep vampy shades yet...I did not pick up K Kahai - thought it would not work on me with it's yellow lean. I do like Desert Sun from that same collection and am going to try the animal stripes on it - those stripes kind of remind me of what I have seen called sugaring stripes only more controlled. I am so with you on Ahoy and Below Deck - that entire collection is huge on my list of favs - so many of them work so well yr round for me. I would add to your collection here maybe the OPI DS Indulgence, Orly Preamp, Zoya Reva & Elephant Walk from ChG with Nubar Black Polka Dot over it (lightly). For me, there is never a season I don't were a fushsia. I have 2 all time favs - OPI Flashbulb Fuchsia (Brights collection)& OPI's Let Me Entertain You (holiday 2010 Burlesque collection). I never can have enough of either of them. Thanks so much, beachgal! Shades like Bevin (and CG Sea Spray from that awesome Anchors Away collection) definitely lobster on my skin tone, but I don't mind lobstering for a pretty colour, heh. And it's definitely going to be hot and humid here for weeks more to come! Elephant Walk actually came really close to being on this list! I hadn't thought to put Black Polka Dot over it, but I bet it would be really pretty. You know, as much as I like pinks and fuschias I don't really own a lot of them, but I'm trying to add some good ones to my collection. I'll keep an eye out for your recs! OoOo There are a ton in here I didn't even think about! Kalahari Kiss, Bossy Boots, etc... Excellent choices!! Also WHY do I not own Zoya Bevin? Is OPI Thanks a Windmillion a dupe? Thank you very much, Brandi!! This was the first time I tried out Zoya Bevin, but it was instant love. Planning to do a full mani with it very soon! Offhand I'd say it's incredibly similar to the OPI, but Windmillion might lean just a little more green? They're close enough that I don't think you'd need both. Great picks! I tried making my list for fall and ended up with over 40 'essentials' on that list, lol. Great picks! I got Bossy Boots back in the late winter when it was released and it is STILL in my untrieds drawer! I need to fix this! Awesome picks! Oooh Bossy Boots is pretty. When you wear Teal of Fortune, do you layer it over another color? When I wore it, I felt it needed an under layer. Or maybe I should have added more coats. Thanks, ChiChi! With Teal of Fortune, I think I'm wearing 3 coats in the picture above. It would have looked even more opaque at 4, but I loved the look of the glitter/foil/whatever magic pieces floating in the jelly, so I was happy to leave it there. If you wanted it to be more opaque without having to do so many, though, I think OPI Fly would be great underwear for it. 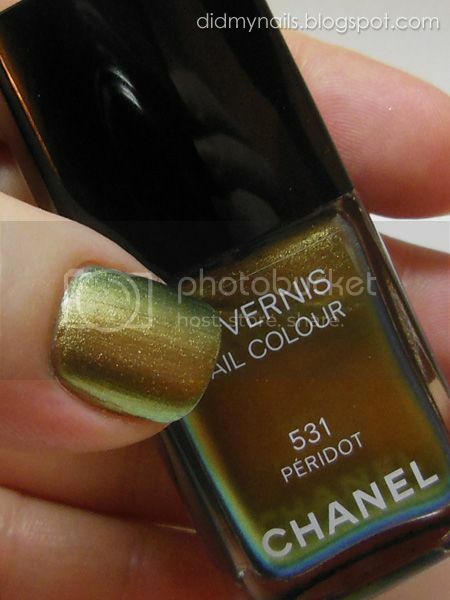 Chanel Peridot and Zoya Crystal are such vivid and stunning shades. Loved your selections for fall and can't wait to see what else you wear during the season. Thank you, Nicole! Crystal isn't necessarily that "autumn" a colour, but it's so great with jeans!